DUBAI – Around a hundred OFWs would always wait at the back entrance of the Shabab Al Ahli Club for Mighty Sports players just to get selfies with them following every game in the Dubai International Basketball Championship. One of those patient Filipinos actually enjoyed some of that kind of spotlight when he was still playing. 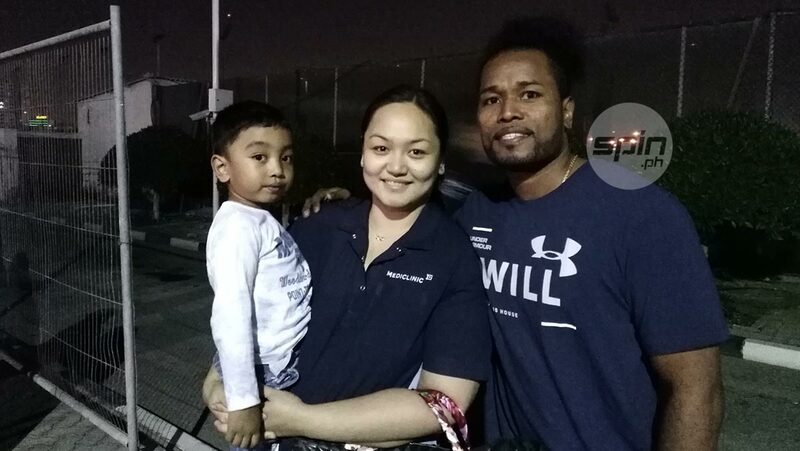 SPIN.ph bumped into former college standout Arnold Booker, who was with his wife and two kids when they were waiting for the Mighty stars to come out after a win in the group stage. The former University of the East combo guard is now an OFW and has been in the ultra-modern United Emirates City for 12 years, currently working as a sales merchandiser at Nestle in Dubai. After playing for UE from 1999 to 2004 in a collegiate career that saw him team up with batchmates James Yap, Paul Artadi, and Ronad Tubid, among others, Booker went undrafted in the 2004 PBA Rookie Draft. He settled instead for the defunct PBL as well as other semi-pro leagues in the Philippines. An ACL injury on his knee, however, sidelined him for a while and diminished his hopes of making it to the pros. After his knee healed from the operation, Booker found an opportunity through Crowne Plaza, which was participating in inter-hotel tournaments in Dubai and was recruiting players from the Philippines. Booker and three others were among those recommended. “At least kahit papaano, nakakalaro pa din ng konti, at the same time, may trabaho, may income,” he added. After working as a concierge for three years, Booker became a sales merchandiser for a trading agency, before transferring to his current employer with the same job. In his free time, the 5-foot-10 playmaker sweats it out in open divisions of small Pinoy leagues in this side of the gulf, bumping into some ex-pros like Ruben dela Rosa and fellow college standouts DJ de Jesus and Raymond Dula, among others. “Hanggang ngayon, by the grace of God, nakakapaglaro-laro pa rin maski papaano,” Booker said. Booker, who turned 39 only last February 2 when Mighty beat the UAE national team, still looks like he can play competitive basketball. So much so that his friends often suggest that he return to the Philippines and play in leagues like the MPBL. Although he has some “what ifs” about his basketball journey, Booker is happy here he is with his family. 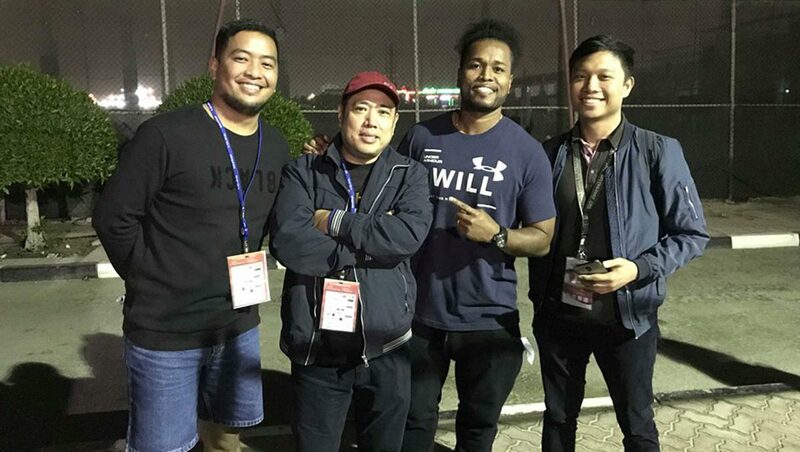 Arnold Booker poses with fellow UE alumnus and Tempo sports editor Rey Lachica, Dubai-based sportswriter Jerome Lagunzad, and the writer.